Overview: Mathieu Guerin produces a fascinating investigation and theoretical discussion of the American Legislative Exchange Council (ALEC), a not-for-profit organization that brings together corporate representatives and state legislators—thus “marrying” both capital and the state. Behind closed doors, Guerin reveals, the representatives and legislators design and vote on model bills. Legislators then bring the model bills home to their respective assemblies and attempt to implement them. The corporate members of ALEC are, in this way, empowered to change citizen’s rights without interference from the federal government. By fostering close ties with state legislators, these corporations have the power to impose their vision of society without recourse to military or police violence. Guerin also investigates the connection between the character of gentrification in San Francisco and the bullying might of Silicon Valley’s ALEC-affiliated corporate technocracy. This case study demonstrates how capital co-opts the existing state structure as a mode of subjugation and repression. Guerin’s research and analysis conclude that ALEC is an organization that symbolizes a corporate imperium rooted in the rise of neoliberalism in the early 1970s and emerging within the established imperial state of the US. An in-depth look at the infamous Powell memorandum reveals an imperialistic ideological continuity between its conception in 1971 and ALEC itself. 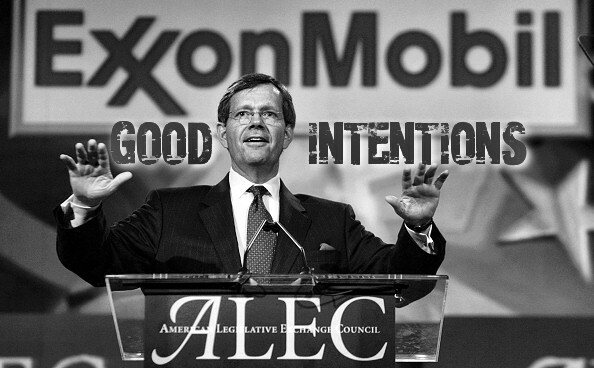 ALEC identifies itself as nonpartisan, although its affiliation with oil giants and the NRA, as well as its arduous labouring against environmental sciences and activism, reveal a clearly conservative agenda (CMD, 2014/4/5). I ask how imperialism functions in our time, one where corporations not only circumscribe and permeate the nation-state infrastructure through organizations like ALEC, but also co-opt it to change policy and thus to impose their vision of society without necessarily resorting to military or police violence…. Reneging on any sense of corporate responsibility is a fundamental feature within the neoliberal narrative, where human needs are to be met by the market, and where the importance of human needs are secondary to capital accumulation—and this is also a fundamental contradiction, since capitalists impoverish the workers whose incomes are needed to purchase commodities (Hanieh, 2006, p. 190). The passage above was thus is a call to reverse the power relations between the corporate and social order. Where corporations putatively foster economic growth which is deemed to be beneficial to the social order (for example, by providing tax revenue for the state, increasing employment rates, and increasing the standard of living), Powell’s aim was to politicize American business and for corporations to take action against the public (represented by the intelligentsia, the media, and politicians). Powell provided several strategies to the Chamber of Commerce to the end of implementing this reversal. The strategies in question target specific aspects of public life, and are organized under the headings What Can Be Done about the Campus, What Can Be Done about the Public, The Neglected Political Arena, Neglected Opportunity in the Courts, and Neglected Stockholder Power (Powell, 1971, pp. 15–28). Notably, Powell encourages the Chamber of Commerce to intervene in the staffing of colleges and universities, to monitor and evaluate the “quality” of textbooks and of national television programs, to monitor “news analyses,” and to pay for advertisements aimed at “the overall purpose of [informing] and [enlightening] the American people” (Powell, 1971, p. 24). In light of what Powell’s marshaling of corporate force meant for the American populace, as well as the subservience it envisioned for the state, it is apt to call what is being staged in the Powell memo as a non-violent coup d’état. According to Bill Moyers, the Powell memo was the inspiration behind the establishment of lobbying groups and think-tanks such as the Heritage Foundation, the Business Roundtable, the Manhattan Institute, Americans for Prosperity, the Cato Institute, and of course, the American Legislative Exchange Council, inaugurated by Paul Weyrich only two years after the memo had been circulating in the corporate world (Moyers, 2011/11/2)…. Center for Media and Democracy (CMD). (2014/4/5). ALEC Exposed. The Center for Media and Democracy. Hanieh, A. (2006). Praising Empire: Neoliberalism under Pax Americana. In Colin Mooers (Ed. ), The New Imperialists: Ideologies of Empire (pp. 167–198). Oxford, UK: Oneworld Publications. Moyers, B. (2011/11/2). How Wall Street Occupied America: Why the Rich Keep Getting Richer and Our Democracy is Getting Poorer. The Nation. Powell, L. (1971). Confidential Memorandum: Attack on American Free Enterprise System.